A fair catch is a feature of American football and several other codes of football, in which a player attempting to catch a ball kicked by the opposing team – either on a kickoff or punt – is entitled to catch the ball without interference from any member of the kicking team. A ball caught in this manner becomes dead once caught, i.e., the player catching the ball is not entitled to run with the ball in an attempt to gain yardage, and the receiving team begins its drive at the spot where the ball was caught. A player wishing to make a fair catch signals his intent by extending one arm above his head and waving it while the kicked ball is in flight. The kicking team must allow the player an opportunity to make the catch without interference. The primary reason for the fair catch rule is to protect the receiver. A receiver directs his attention toward the incoming punt and cannot focus on the defenders running towards him. He is quite vulnerable to injury and is also at risk for fumbling or muffing the kicked ball if the punter intentionally makes a high short kick to allow defenders time to hit the receiver. A second reason for a fair catch, on a punted ball, is to prevent the ball from rolling toward the receiving team's goal and being downed deep in the team's own territory. Both the 2001 and 2020 versions of the XFL removed the fair catch in an effort to attract fans who disliked the rule. 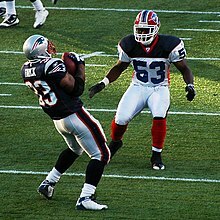 Canadian football and arena football also do not have fair catch rules, with the XFL and Canadian football preferring a five-yard "no-yards" rule instead. In rugby union and Australian rules football, a loose equivalent to a fair catch is called a mark; see mark (rugby) and mark (Australian football) for more information (however in Australian Rules Football the player is not protected from the opposition team while attempting a mark). Fair catches featured in some extinct forms of football, and they have been abolished in other modern codes. In Rugby league the defensive player attempting to catch the ball cannot be tackled whilst in the air, though the attacking players can contest the ball by attempting to catch it themselves. A player who successfully catches the ball is able to be tackled only once they have landed on the ground. A player who does not leave the ground in attempting to catch the ball is able to be tackled as soon as the ball is caught. In American football, a member of the team receiving a punt or kick, may signal for a "fair catch". This is the receiver's choice in which they give up the right to advance the ball in exchange for protection from being tackled when they are focusing on the incoming ball, and thus vulnerable to serious injury. To signal a fair catch, the receiver must raise one arm fully above their head and wave it from side to side while the ball is in flight. If the receiver fails to give a proper signal (arm not fully extended), the receiving team is penalized five yards for an invalid fair catch signal from the spot of the signal, and the player is not protected from being tackled. If the receiver attempts to advance the ball after signalling for a fair catch they are penalized five yards for "delay of game", as the fair caught ball becomes dead once caught. is guilty of fair catch interference, which is also a personal foul carrying a 15-yard penalty. If the interference is deemed to be flagrant, the kicking team member will also be ejected from the game. A player signaling for a fair catch is not required to catch the ball, but after making the signal, may not initiate contact with any member of the kicking team until the ball is touched by another player. If they do so, they will be penalized 15 yards for unsportsmanlike conduct. If the ball hits the ground or a member of the kicking team, the fair catch is cancelled and rules for kicked balls apply. If the receiver "muffs" the ball (touches it, but then fails to obtain control of the ball), then the ball can be recovered by either team once the ball touches the ground. A fair catch may be followed by a snap or a type of free kick — the fair catch kick — at his team's choice, and an expired playing period may be extended if the free kick is chosen. The NCAA abolished the fair catch from its rules for American football in 1950, but restored it in 1951 without the option of kicking from the mark of the catch (which is retained in rules of the National Federation of State High School Associations and the National Football League). If the kicking team commits kick catching interference on a returner who has given a valid fair catch signal, the receiving team retains the right to a fair catch kick from the yard line where the ball is spotted following the penalty. The fair catch signal can also be used as a legal form of deception: If the receiver has no intention of actually fielding the ball, but wishes it to roll into the end zone for a touchback, he may signal for a fair catch in front of where the ball will land, which makes the kicking team think it will not reach the end zone. A fair catch on a kickoff return is used primarily on short kickoffs to prevent a ball kicked high in the air from being recovered by the kicking team. Since the 2018 college football season, fair catches are now commonly employed on kickoffs that do not reach the end zone, but are perceived (for whatever reason) as having little potential for a successful return beyond the 25-yard line. This was the result of an NCAA rule change which treats any fair catch on a kickoff between the receiving team's goal line and 25-yard line as a touchback, with the ball being placed on the 25-yard line. Various forms of football descended from certain English school football games of the 19th century have had a fair catch. It was abolished early in the development of soccer, then in the middle of the 20th century by Canadian football, and slightly later by rugby league. Forms of football retaining a form of fair catch (also called "mark") include American (outdoor), rugby union, and Australian rules. The American-invented intramural games speedball and speed-a-way have some of the flavor of the original fair catch, which was to allow handling of the ball in games where handling was otherwise forbidden. Australian rules, speedball, and speed-a-way do not require that the kick be from an opponent. American football requires that the catcher signal in advance, as did Canadian football before that game abolished the fair catch. Rugby union requires a player to signal a fair catch by catching the ball and shouting "Mark!". In some forms of football a player fielding an opponent's kick must be given a certain circular unobstructed space around him in which to do so by either some or all opponents. In rugby union, rugby league, and Canadian football this applies only against members of the kicking team who are offside, and applies whether the ball is in the air, bouncing, or rolling. In Arena Football, there is no fair catch; however all members of the kicking team must refrain from penetrating the five-yard line in coverage, but only while the ball is in the air. The various games differ as to the conditions under which a fair catch will be awarded — for example, whether the ball must be caught "cleanly", i.e. without juggling. Rugby union requires a clean catch. American football allows the ball to be juggled, but not to be intentionally batted forward to improve the position of the catch (as for a free kick at goal). Australian rules is most generous, allowing unlimited hand play with the ball before it is caught, and allowing the kick to be from any other player, regardless of team (however, the ball must have travelled 15 metres) and the ball can even be dropped so long as the player is deemed to have sufficient control of its fall. In the 19th century in rugby, and into the 20th in American and Canadian football, a fair catch was allowed from certain kicks of a teammate—a punt-out or punt-on.